You are here: Home / Cases / Case 1: Who’s afraid of the big bad Wolff? 21 year old girl. Clean bill of health. 1 hour of unrelenting palpitations that stopped her being able to concentrate on writing her dissertation. On standing to get a cup of tea she feels very dizzy and like she is about to collapse. She lays down and calls for her boyfriend who phones an ambulance. 15 minutes later the palpitations stop and she feels back to normal… just before the paramedics arrive. She is still taken to the ED to be checked out. She feels fine en route and the ambulance ECG is reported as NSR. She arrives looking so well you wonder what she’s doing in the ED… Turns out she has had 4/5 of these episodes of palpitations/bizarre feeling in chest over the last couple of years. This was the most severe episode, and the closest she had felt to losing consciousness. All episodes had occurred at rest, and she could identify no specific triggers. She denies any history of diagnosed arrythmias, anxiety/panic attacks, illicit drug use or excess caffeine intake. There is no significant family history. Observations: T 36.5, BP 114/75, HR 71, RR 14, SO2 99 on room air. Conclusion: short PR, delta wave = possible Wolff Parkinson White Syndrome! 70% have no underlying structural heart disease (though is associated with HOCM, Ebstein’s malformation, transposition of great vessels). Classic ECG triad – short PR interval, delta wave, widened QRS complex. Conduction goes down the normal pathway (via the AV node + His-Purkinje system) and an accessory pathway (no AV node). 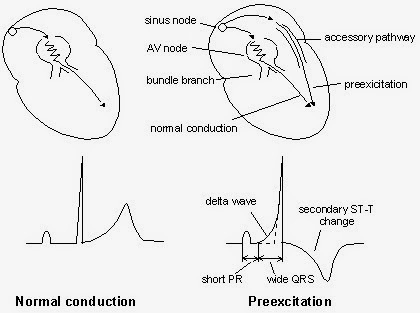 As a result, some conduction hits the ventricle early (hence WPW is a ‘pre-excitation’ syndrome) – this is represented on the ECG as a short PR interval. There is then myocyte to myocyte (i.e. abnormal) conduction through the ventricle and this produces the delta wave on the ECG. When the normal pathway conduction reaches the ventricle, it catches up – and so the remainder of the QRS appears normal. WPW is NOT always obvious on the ECG. The short PR interval will always be present in all leads. Delta waves may NOT be present in all of the leads. If you see a short PR interval, be extra vigilant for delta waves, and closely examine EVERY lead. If you just focus on looking for delta waves (and not the PR interval), you may miss WPW. Examining the PR interval is the key! The accessory pathway is made up myogenic fibres called ‘Kent Bundles’. There are two types of WPW – Type A has a positive QRS in V1, and Type B has a negative QRS in V1. In reality this classification is clinically irrelevant as both present and are managed identically. Possible exam relevance though! For the record my patient had WPW type B. 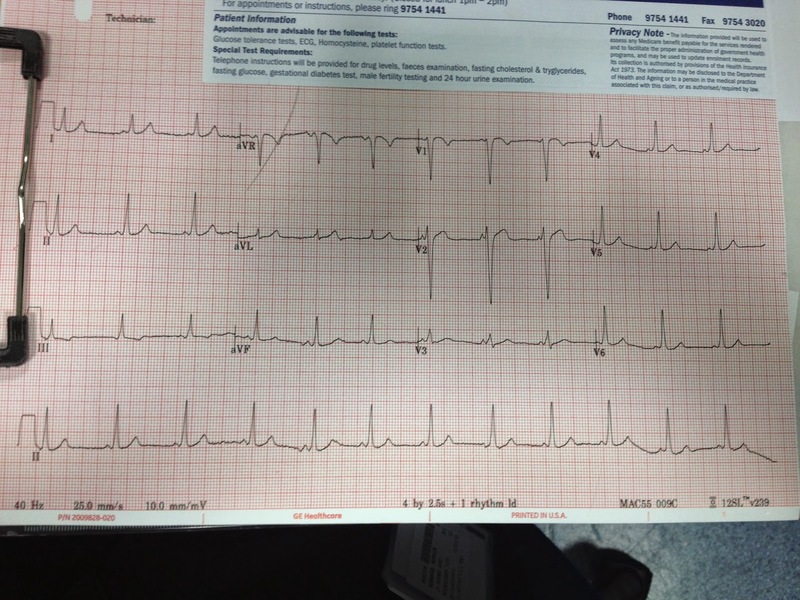 These tachyarrhythmias are how WPW presents to the ED. WPW presenting with SVT is usually straightforward to manage. WPW presenting if AF is NOT!! 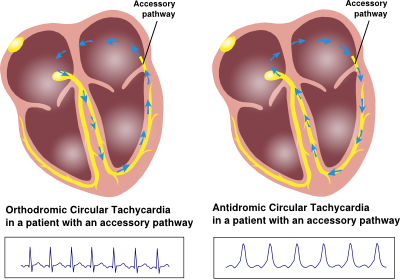 Conduction goes through the AV node, and then re-enters via the accessory pathway. Therefore – no delta wave, QRS narrow. It will look like a ROUTINE SVT. Most patients that present to the ED have the orthodromic SVT, and so WPW is difficult to pick up initially. Treating the patient as a routine SVT (i.e. interrupting the reentry circuit) with vagal manoeuvres, AV nodal blockers (adenosine, verapamil) or electrical cardioversion will work perfectly well. 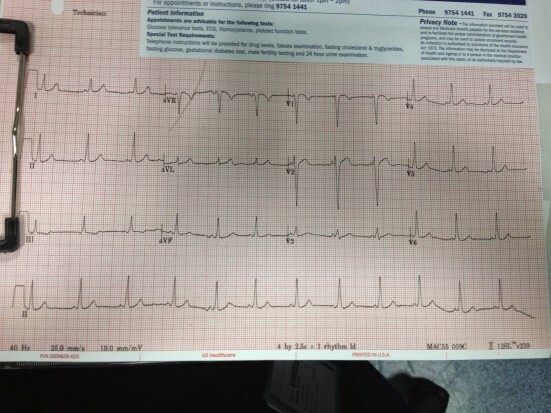 When the patient has reverted to sinus rhythm, be sure to look carefully at the new ECG for the WPW triad. Conduction goes down through accessory pathway and re-enters via the AV node; therefore delta wave and wide QRS are present. 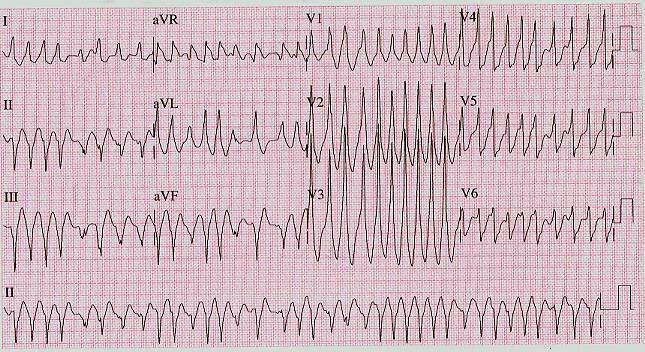 Regular, wide complex tachycardia… It will look like VENTRICULAR TACHYCARDIA! There is NO reliable technique to tell the difference between WPW with antidromic SVT and VT. If you mistakenly think the patient is in VT, that’s OK. Treat the patient with VT therapies and the patient will revert successfully. Using electrical cardioverson, procainamide (which preferentially suppresses the accessory pathway) or amiodarone will do the job. AGAIN, don’t forget to properly interrogate the ECG after the patient has reverted, and look for WPW. Conclusion: very, very fast AF with variable morphology = WPW with AF! BE VERY WORRIED! 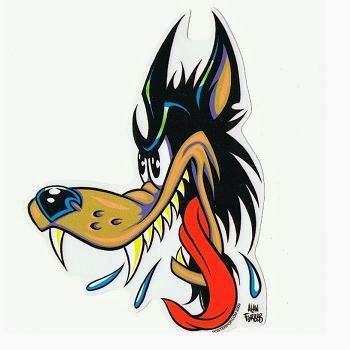 THIS A KILLER! DO NOT GIVE AV NODAL BLOCKERS!!!! With routine fast AF (with no WPW), it is highly unusual to see a heart rate higher than 150-180. A fibrillating atrium contracts >300/minute, but many impulses are stopped in their tracks by the protective AV node – allows a maximum rate of approximately 200. When there is an accessory pathway, the impulses from the fibrillating atria are conducted down the normal pathway AND the accessory pathway. This means there are some narrow complexes and some wide (changing QRS morphology) and there is an extremely high heart rate as the accessory pathway has no AV node. These diagnoses would routinely be treated with AV nodal blockers (calcium channel blockers, beta blockers, amiodarone, digoxin, adenosine). In WPW with AF, this is POTENTIALLY DEADLY. Don’t miss it on the ECG! If the AV node is blocked, EVERY impulse from the atria is conducted down the accessory pathway, and the patient can go into VF. Treat WPW with AF with electrical cardioverson. These patients tend to be younger, and are not in chronic AF – therefore don’t worry about dislodging clots, go ahead and shock them! Procainamide can also be used, as it preferentially blocks the accessory pathway… though it’s not available in Australia. Even without giving AV nodal blockers, WPW with AF cause spontaneous sudden cardiac death – ‘Manifest WPW’. In most cases of WPW, delta waves are NOT present in all of the leads. When you find a short PR interval (key finding! ), then start hunting for delta waves in ALL the leads. WPW with orthodromic SVT (narrow QRS) can be treated just like any run-of-the-mill SVT. WPW with antidromic SVT (wide QRS) can be treated just like VT.
WPW with AF is a KILLER. Do NOT give AV nodal blockers (including amiodarone)! Just shock. Closely examine the ECG after reverting any patient and look for the the WPW triad. The 21 year old girl I saw in the ED had probably gone into a WPW tachyarrhythmia and self-reverted just before the arrival of the ambulance. She remained well throughout her time in the ED, with no arrythmias caught on the cardiac monitor. Her inflammatory markers and electrolytes were normal, pregnancy test negative and CXR unremarkable. I discussed her case with the on-call cardiology consultant. He was happy to discharge her with urgent outpatient follow-up with an electrophysiologist, with a view to a radiofrequency ablation procedure – which is the definitive, curative management in these patients.